“ROASTED” Stir-Fry: Chicken and Vegetables with Delectable Noodles (serves 6) | Crappy Kitchen - Good Dinners! This dish was a resounding success on so many levels – hurrah! It is winter and roasted vegetables is one of the pleasures of being in a cozy kitchen when it is freezing cold outside. I found some great bone-in, skin-on chicken breast but wanted some kind of Asian-spiked noodle dish. I didn’t want a basic stir-fry, but I wanted something like that, only a little richer, more home-y. I was in the mood to experiment and this is what I came up with; true deliciousness! The components were cooked separately and then all thrown together in a big bowl right at the end. It is dead simple to make, but the resulting dish has layers and layers of flavor and complexity. Definitely something to try! good quality egg noodles for six people (I used Blue Dragon egg noodle nests; one 1 oz nest per person). 1 – Mix the ingredients listed in the chicken marinade together in a shallow dish or bowl. Add the chicken and marinate for at least 20 minutes in the fridge, turning every now and then to get the whole piece coated with marinade. (You can do this ahead of time and leave it in the fridge until ready to roast). 2 – Place the chicken pieces in a baking dish and cook for 40 minutes, (you can cook the vegetables at the same time – method below). Remove and when cool enough to handle, remove the skin and shred the meat into large bite-sized pieces. Mix 1 tablespoon or mirin, 1 tbs soy sauce and 1 tsp sugar in a bowl (mix well) and pour over shredded chicken and toss. Set aside. 1 – Put all the prepped vegetables into a large bowl and mix the roasting liquid together in a small bowl and then mix into the vegetables, coating everything well. 2 – Place a large baking sheet in the oven with 3 tbs oil (olive, canola, safflower) and leave for 4 minutes. 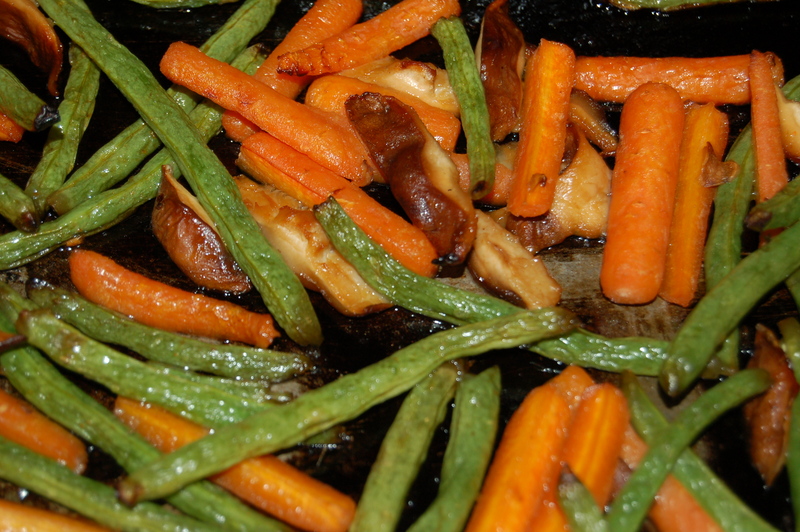 Remove and immediately spread the vegetables into the sheet in an even layer. lace in oven for 12 minutes. Remove from oven, toss and place back into oven for another 10 minutes. Toss the shredded chicken with the roasted veggies in a large serving bowl. Cover and place the bowl in the cooling oven to keep food warm, and to heat up the bowl which can be used to serve the final dish. Put water on for noodles right when you take the chicken out of the oven . Cook noodles according to instructions. Try to time the noodles to be done when the meat is shredded and it has been mixed with the veggies in the serving bowl. When noodles are cooked, drain and toss into the bowl with the chicken and veggies. Pour in about half of the drizzling sauce to the dish and toss gently. Serve, passing the hot sauce (sriracha) and a little drizzle of sauce if you need it. This entry was posted in "Blood Type A " Recipes, dinners and tagged Blood Type A diet, blood type A dinner, blood type A recipe, blue dragon noodles, chicken stir-fry, egg noodles, noodle stir-fry, noodles, roasted stir-fry, roasted vegetables, shredded chicken, stir-fry, stir-fry noodles, vegetable stir-fry. Bookmark the permalink.